Gravity Diverter Valves are often used to control and direct product flow in a gravity feed situation. Although simple in principle, it is very important to consider the entire process when selecting a Gravity Diverter Valve (GDV). Nu-Con’s two-way demountable Gravity Divert Valves are ideal for system installations that require frequent cleaning with minimum downtime. The design allows fast, tool-free disassembly in installed location and easy access to all product-contact surfaces. Gravity fed material is diverted to either of two lines by a rotating blade that swings through 120° to fully close off the unused port. 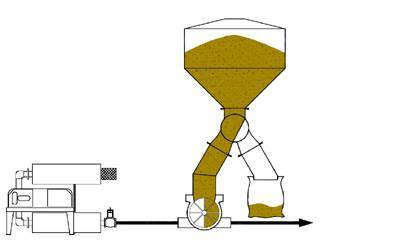 Closing off the unused port is an important design feature, often overlooked when selecting a GDV, some GDV’s that use a simple open bucket pivoting between the two discharge legs will actually allow product to incorrectly discharge down both legs at the same time if product is allowed to bank back up into the GDV due to a stoppage downstream or overfeeding, this will not happen if using the Nu-Con GDV, as shown in the drawing below. Material flow through the valve is unrestricted with no ledges or dead spots. Shaft seals selection of either – gland, air purged gland, “U” or air-purged “U” seals to suit the required installation. Off board, lubricated, sealed bearings mean they are maintenance free for the life of the bearings. Changeover can be performed with material flowing. Useful if being used to feed between two Bulk Bag Filling Stations or if acting as a Diverter after an Inline Metal Detector. One-piece body with removable end plates and rotating blade assembly. Round, rectangular or custom process connections, such as BFM fittings or Tri-Clovers. Selecting the correct style GDV to suit your process can be critical.